15 years ago the base units of northwestern and eastern areas of the Border Troops of Ukraine was set up North direction of Border Troops of Ukraine, which was later reorganized into the Northern regional management center in Zhytomyr. Under the protection of the three regional groups of border controls - Chernigov, Zhitomir and Lutsk - state border area taken total length of 1,358.6 kilometers. 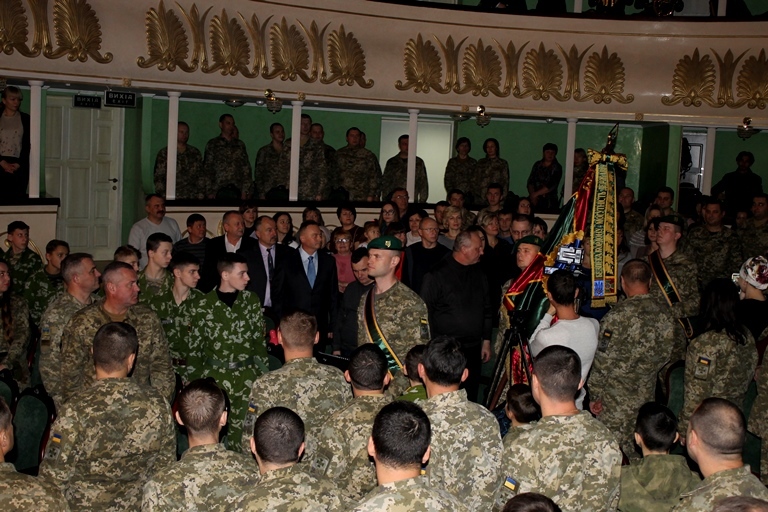 At the celebrations which took place in Zhytomyr oblast philharmonic society. Sviatoslav Richter attended Head UDMS Ukraine in Zhytomyr region Alexander Radko, who particularly noted that struck over the years the most difficult, the most difficult stage of organizational development, North regional administration occupied a worthy place in the border troops of the independent state, became a reliable outpost protecting its sovereignty and economic interests on the northern frontiers. Tireless perseverance, determination and dedication of soldiers guards a guarantee that the assignments to improve border security are met native Motherland with honor and impeccable performance of military duty will increase glorious traditions of the older generations. Said Alexander S. proper interaction of regional management of LCA and Northern Regional Directorate of State Border Service and wished the whole personnel of good health, great happiness, energy and success in the noble cause of serving the Motherland.